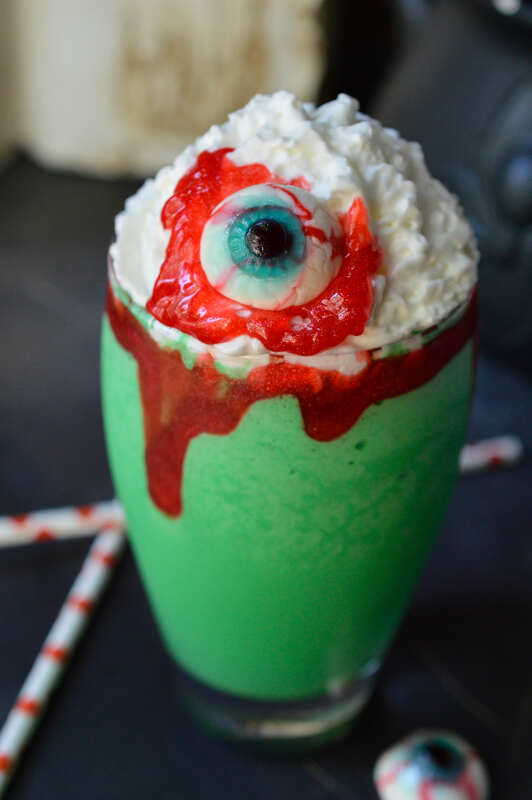 Make this Eye of Toad Halloween Milkshake Recipe for all of your creepy little monsters! This Halloween dessert is made with cookies and cream ice cream, green coloring, whipped cream, red blood gel and topped with a gummy eyeball. This fun recipe is kid approved! We love Halloween around here. 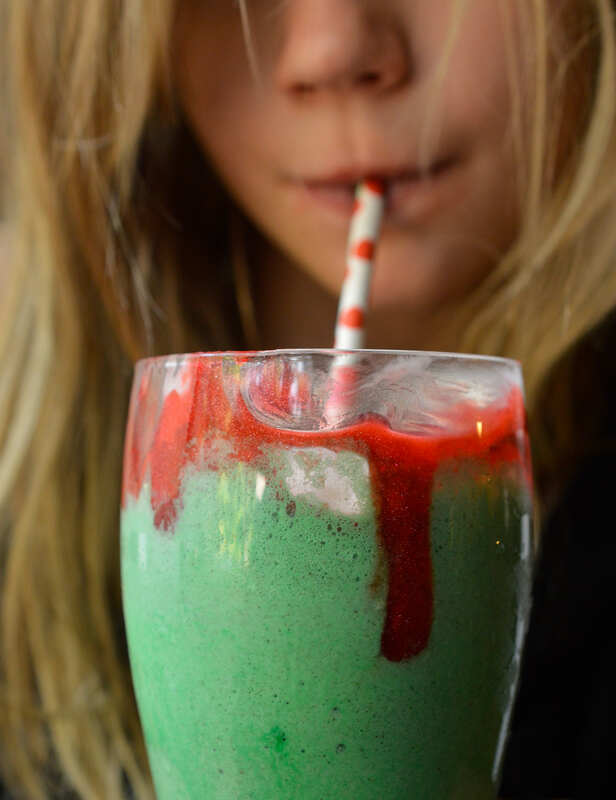 My daughter gets excited when I start making creepy treats, like Slime Monster Donuts, Bloody Apples, Jack Skellington Apples or this Halloween Milkshake Recipe. Our house is decorated in a pumpkin and witch theme. My daughter plans her costume for months before Halloween. And we go trick or treating and to a Halloween festival each year. We are serious about Halloween! On a recent Target shopping trip we noticed these awesome gummy eyeballs. My daughter begged to get them. She didn’t really need to beg because I had already decided that these would be great in a Halloween dessert recipe. My daughter came up with the name of this milkshake. 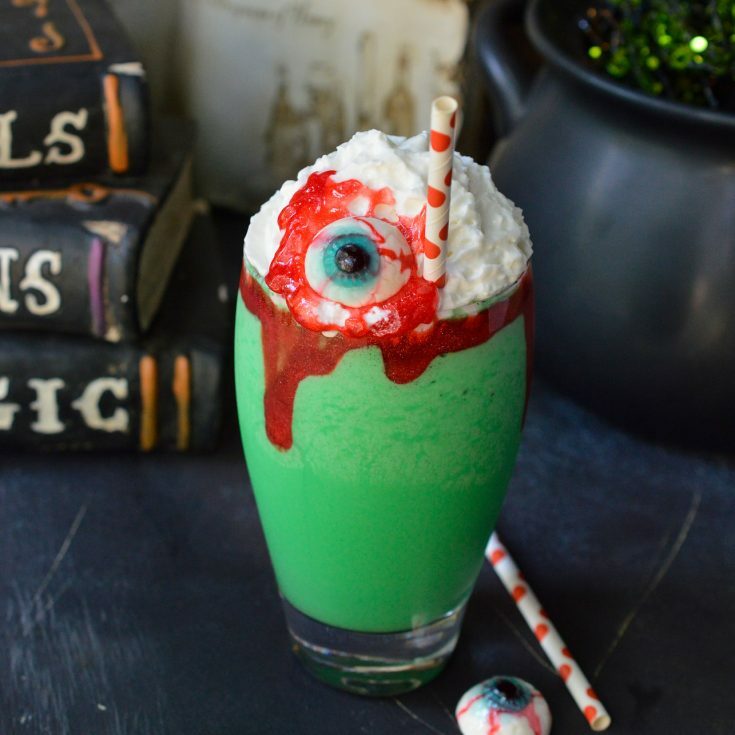 Eye of Toad Halloween Milkshake is a perfect match to the bright green color and all of our witch decor. Just be sure to keep your eye on your milkshake, otherwise some ghoul might steal it! Blend ice cream, milk and green coloring until smooth. Rim the inside of glasses with enough red gel that it begins to drip down. Carefully pour milkshake into glasses. Top with whipped cream, a dollop of red gel and a gummy eyeball. 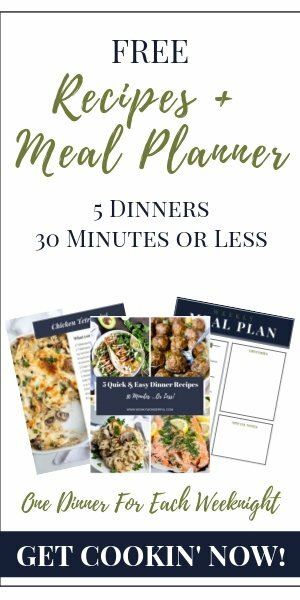 This recipe makes 2 small servings or 1 large serving. This is so fun! I love anything gross for Halloween!! !